It’s an icy, stony world! This composite was stitched from four photos taken by Rosetta 19 miles (31 kilometers) from the center of comet 67P/Churyumov-Gerasimenko on Nov. 20, 2014. One pixel shows 10 feet, or three meters. With the astonishing success of the European mission to comet 67P, comets are back in the news. Rosetta the spaceship sent its slave spaceship, Philae, to land on 67P on Nov. 12, 2014. After Philae quit bouncing up and down in the comet’s microgravity, it landed in a place with limited sunlight. With insufficient electric power from its solar panels, the lander got down to business for about a day, and worked until it exhausted its batteries. What have we learned from the European Space Agency’s Rosetta mission, which began traveling toward Comet 67P/Churyumov-Gerasimenko 10 years ago? Not too dense! Density measurements released today by Rosetta scientists match well with those taken from Deep Impact in 2005, says comet expert Michael A’Hearn, of the University of Maryland. 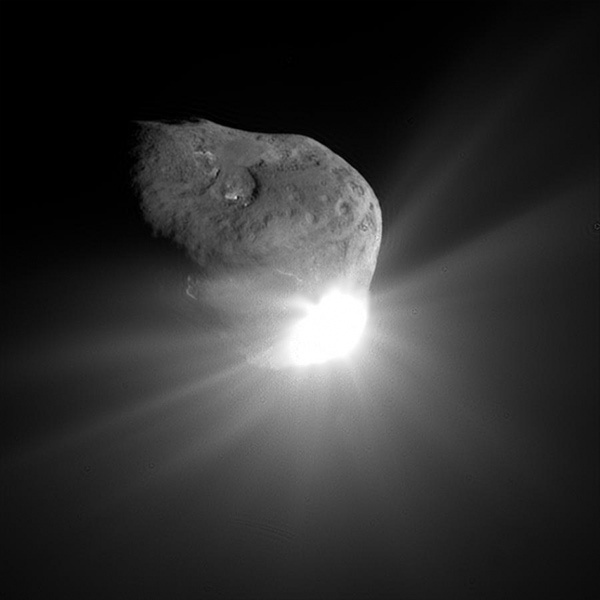 The Deep Impact mission fired a missile at Comet Tempel 1 and studied the results. To figure the density of the comet’s nucleus, they measured how fast junk lofted by the impact fell back under the comet’s gravity. Since gravity is a function of the object’s mass, the technique gives “a direct measure of gravity,” A’Hearn says. Using this and another method, Deep Impact scientists calculated a density of less than 0.5 grams per cubic centimeter. Nicolas Thomas, et al, Science1. My beautiful regions! 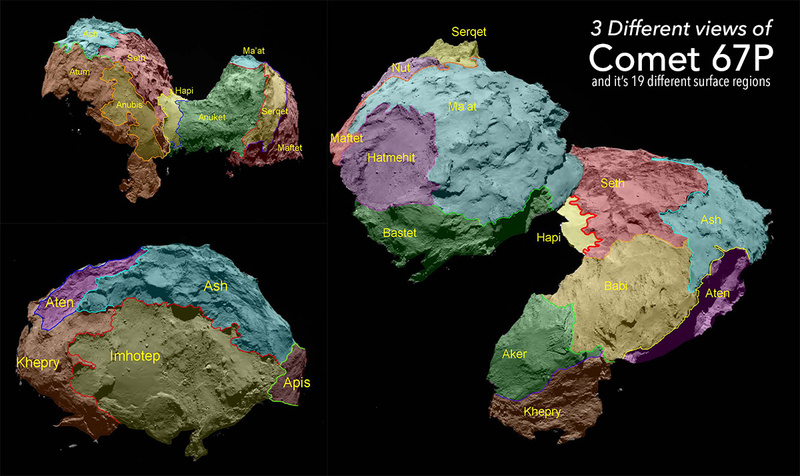 The highly variable surface of 67P is shown in a just-released study, showing at least 19 different regions, named for Egyptian gods. Based on appearance, the scientists found, “dust-covered terrains, brittle materials with pits and circular structures, large-scale depressions, smooth terrains, and exposed consolidated surfaces.” The study may lay to rest a common assumption about comets, the authors wrote. “The concept of cometary nuclei as rather uniform, pristine, proto-planetesimals that may have been subjected to collisional processing is persistent, despite evidence of regional differences” seen on other comets. The current observations, they added, “have revealed an irregular-shaped, processed nucleus surface with morphologically diverse units.” In other words, just like galaxies, stars and planets, objects that were once assumed to be similar and ultimately boring seem to be anything but. Viva la cometology! Weird water: Even before Philae’s epic comet-touchdown, mother-ship Rosetta snared some provocative data2 about frozen water on the comet. 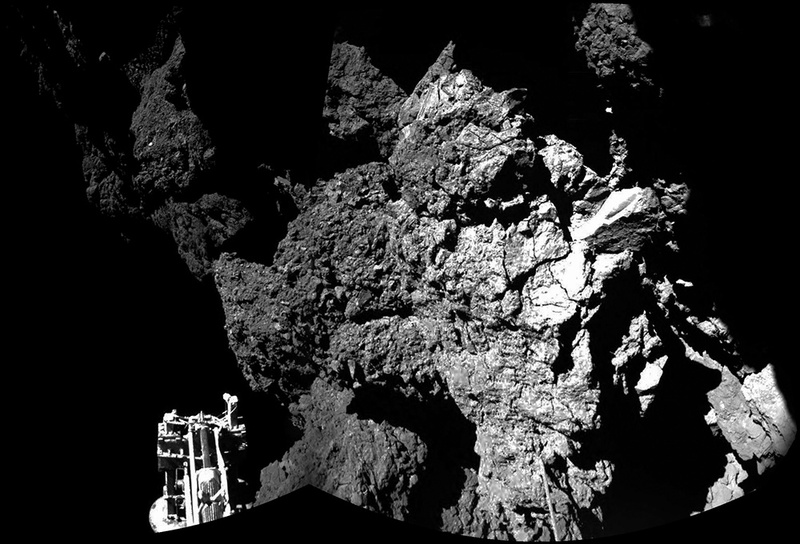 The Philae lander of the European Space Agency’s “Rosetta mission landed safely on the surface of Comet 67P, as shown in the first pix from Philae’s camera (notice one of the lander’s feet?) Early results were just announced from Philae’s stableful of scientific instruments. What’s up with the science of Cometology, class of 2015? What is the origin of Earth’s water, the key to life? Earth was hotter than blazes for millions of years as the sun and its planets condensed from a fiery glob of gas and dust, so any water would have evaporated. Planetary scientists have thought that our water might have been delivered by comets, which are, indeed, dirty snowballs. “Oort Cloud” comets formed around Uranus and Neptune, and then moved far beyond Pluto. “Jupiter family comets,” including 67P, formed in the Kuiper Belt further from the sun, then moved inward toward Jupiter’s orbit. The D-H ratio, A’Hearn says, should reflect temperatures when the water formed, so each of the major comet families should have a characteristic D-H ratio that reflects its origin. The frigid conditions found farther from the sun produce a higher deuterium ratio. But if the Jupiter family comets all formed in the Oort cloud, as believed, why do comet studies show them having such a range of D-H ratios? A second problem begs for solution: the new D-H ratio calculated for the Jupiter family comet 67P, is three times that found in Earth’s oceans, meaning that those comets may not have delivered water to Earth. Perhaps some or all of the water came from asteroids, even though they have a much lower percentage of water than comets. The isotopic evidence of cometary heritage exemplifies the role of comets as messengers from the aborning solar system. The ensuing 4-plus billion years have completely and repeatedly transformed our planet, yet barely changed the comets. Why are some comets visible to the naked eye and not others? From Earth, the brightest comets are those with small perihelion (closest pass around the Sun) and perigee (closest pass around the Earth), so the comet is both better illuminated and closer to stargazers. 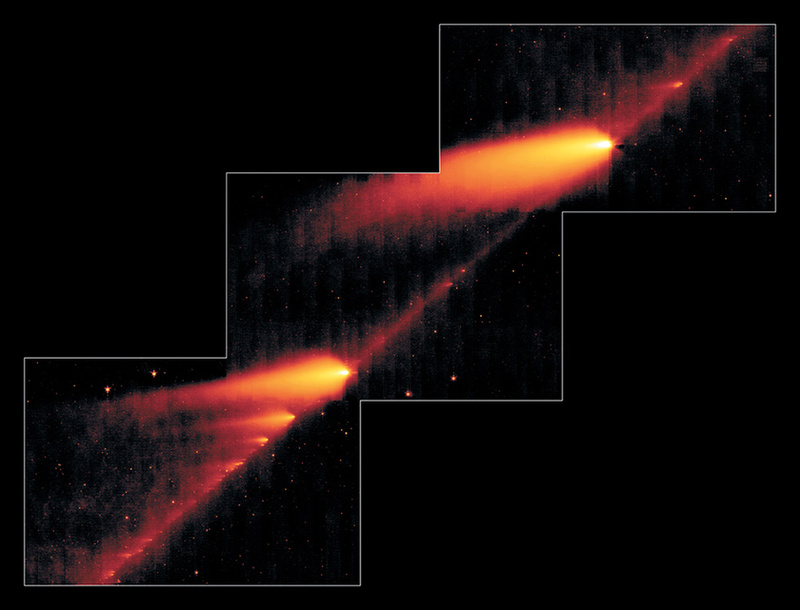 Humans have witnessed these extra bright comets for as long as we’ve been looking up. 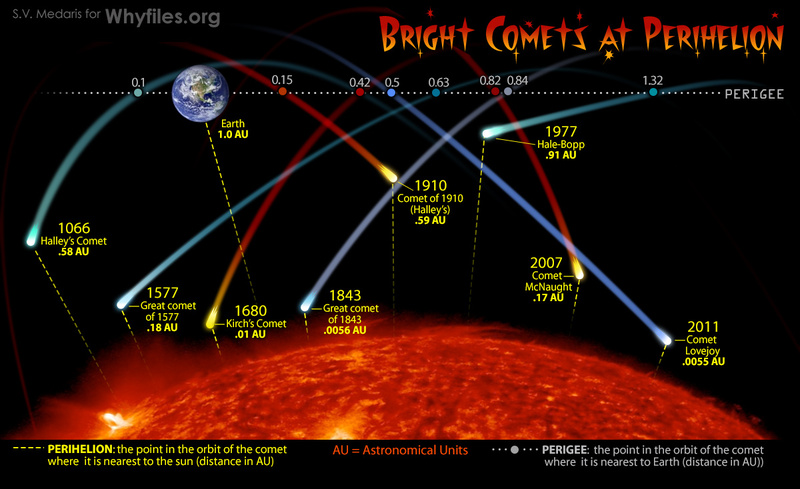 This diagram shows theoretical orbital positions of some of the brightest (and most engaging) comets of the last millennium. Top: Original image, showing nucleus and bright part of surrounding coma (dust that travels with the comet). 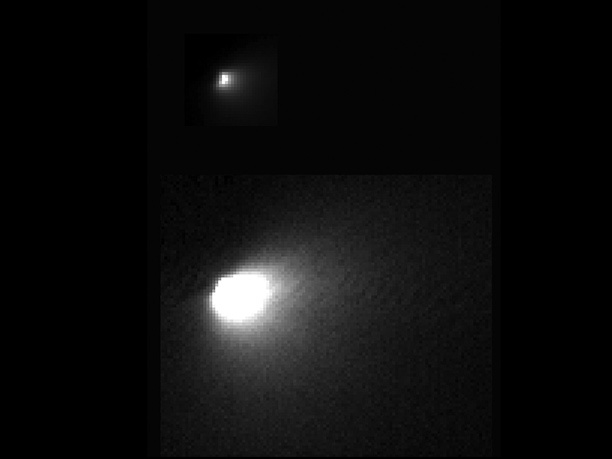 This image provided the first good data for the size of the nucleus of a long-period comet. This one is about 0.5 kilometers across. Bottom: Image doctored to show full extent of coma. A payload from NASA’s Deep Impact spacecraft committed suicide against comet Tempel 1 in July 2005. In this photo taken 67 seconds later, light from the collision saturated the camera’s detector. 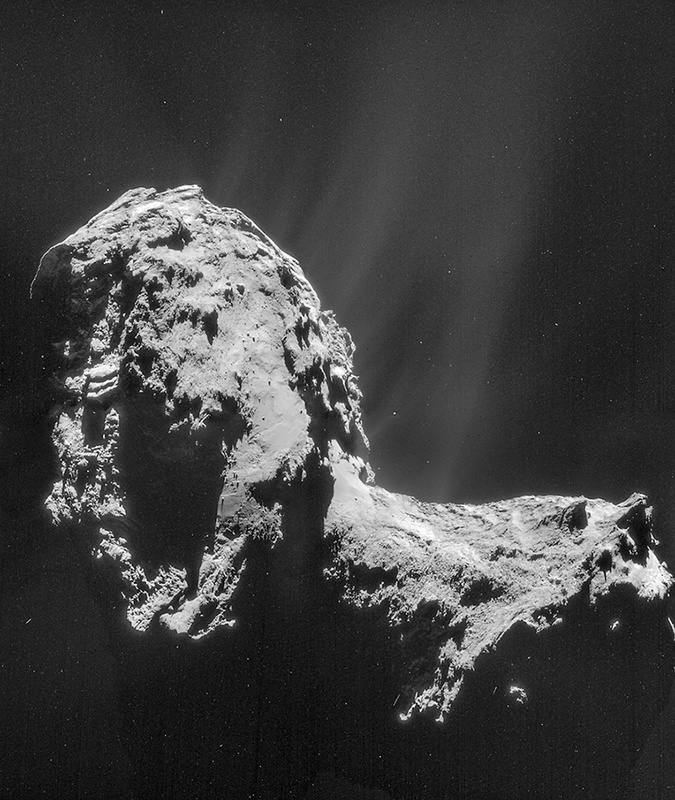 Sunlight shows ridges, scalloped edges and possibly ancient impact craters on the comet’s surface. Rollover left: in one of the last photos from the impactor, arrow shows the direction of travel; yellow spot shows the target. Rollover right: a plume of comet-crud was kicked up in a photo taken about 700 seconds after the impact.